Page from Copernicus's On the Revolutions (De revolutionibus orbium coelestium). 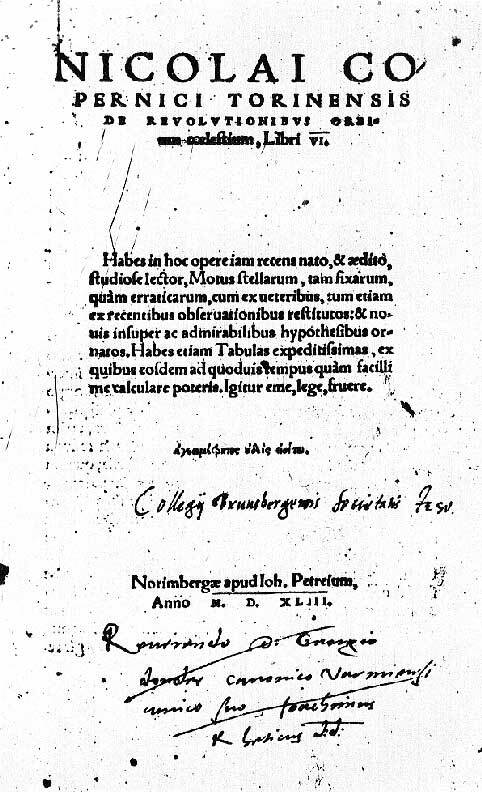 Copernicus dedicated his 1543 book to Pope Paul III. Revolutions in science, as in politics, often go beyond the limited changes that the people who started the revolution had in mind. 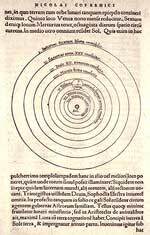 In 1543 Nicholas Copernicus proposed to switch the places of the Earth and the Sun. He put the Sun in the center of the universe and placed the Earth in revolution around the Sun. To account for the daily motion of the heavens, he set the Earth rotating about its own axis. To calculate the positions of planets, Copernicus used elaborate geometrical schemes, much like his Greek and Islamic predecessors (historians are still trying to decide just what sources contributed to his ideas). Ptolemy's system was reasonably satisfactory in matching the observations. Copernicus did not have new and more accurate observations demanding the overthrow of the old theory. It was a yearning for greater mathematical harmony that made him seek something different. In Copernicus's opinion, when Ptolemy had introduced motion around an equant point, he violated the principle of uniform circular motion. Furthermore, from Copernicus' s "heliocentric" (sun-centered) theory, several observed phenomena followed automatically, rather than needing to be adjusted as they were in the Ptolemaic theory. To ascribe movement to the Earth must indeed seem an absurd performance on my part to those who know that many centuries have consented to the establishment of the contrary judgment, namely that the Earth is placed immovably as the central point in the middle of the Universe. 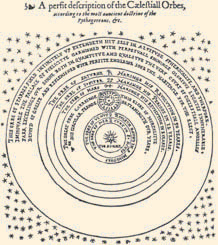 A heliocentric system was counter to long-established belief and seemed unimaginable to many. This is why Copernicus wrote in the preface to his book that he had "hesitated long whether I should give to the light these my Commentaries written to prove the Earth's motion." His friends, though, had "often urged and even importuned me to publish this work." Copernicus hoped that "my labors contribute somewhat even to the Commonwealth of the Church... For not long since the question of correcting the ecclesiastical calendar was debated." Indeed, for centuries, the difficult question of calculating the dates of future Easters had been a main motive of astronomical observations and calculations. In Copernicus's system the rotation of the Earth caused the stars' observed motion, rather than the rotation of the sphere of the stars. So the starry sphere was obsolete. In the ancient and medieval world view, the universe is bounded by an outer sphere containing all the stars. The outer starry sphere is simply a region of heaven, centered on the Earth, in this drawing (above, left) from a 1566 book by Leonard Digges. His son Thomas finally recognized that the sphere of stars was not logically needed in a universe where the Earth rotated. His drawing (right), centered on the Sun, shows the stars scattered through a vast open space. Yet this logical consequence of Copernicus's innovation was not immediately realized, by Copernicus or by others. It was finally recognized by Thomas Digges, in a drawing he added as part of an appendix to his father Leonard's book. Leonard Digges had translated and paraphrased the key parts of Copernicus's work, he said, "to the end such noble English minds (as delight to reache above the baser sort of men) might not be altogether defrauded of so noble a part of Philosophie." Now the Earth was no longer unique. It was merely one of many similar objects in the solar system. If the Earth were but one of many similar planets, other planets might also have similar inhabitants. The principle of "plenitude," which interpreted any unrealized potential in nature as a restriction of the Creator's power, further encouraged belief in a plurality of worlds. This conclusion was most dramatically emphasized by Galileo and his new telescopic observations. 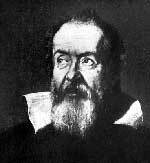 Galileo Galilei (1564-1642) in his early forties, a few years before the beginning of his ground-breaking telescopic observations in 1609. Galileo's father wanted him to study medicine, and he did so briefly at the University of Pisa. But Galileo preferred mathematics. He studied with private tutors in Pisa and then at home, in Florence. Soon he was giving private lessons in mathematics and was later appointed to the vacant mathematics chair at the University of Pisa. Here he is said to have dropped iron balls from the leaning tower, as a public challenge to Aristotelian philosophers, who said that heavier balls should fall faster. They don't. While Galileo probably never acted as this legend tells, it is true to his spirit  challenging authority, thinking clearly, and relying upon actual observation. Aristotelian professors were certainly not friendly to Galileo, and he soon moved to the University of Padua. Galileo built a telescope and was the first to use this new instrument to systematically explore the heavens, making astonishing discoveries. For example, he discovered four satellites of Jupiter early in 1610. He named them the Medicean stars, after Cosimo de Medici, the Grand Duke of Tuscany. Later in 1610 Galileo returned to Florence as mathematician and philosopher to the grand duke and chief mathematician of the University of Pisa, without obligation to teach. Nothing was so disturbing to old ideas as what Galileo saw when he turned his telescope on the Moon. His observations of the Moon's surface inspired the revolutionary conclusion that the Moon was not a smooth sphere, as Aristotelians had maintained. It was uneven and rough, like the Earth. What then of the ancient dogma that only matter below the sphere of the Moon was earthy and imperfect? The moon as drawn by Galileo. The surface of the Moon is not smooth, uniform, and precisely spherical as a great number of philosophers believe it to be, but is uneven, rough, and full of cavities and prominences, being not unlike the face of the Earth, relieved by chains of mountains and deep valleys. Another similarity, this one between Jupiter and the Earth, was furnished by Galileo's discovery of four satellites of Jupiter, similar to the Earth's single moon. How would they possibly fit into the system of spheres used by everyone since Plato? Galileo considered the "four planets never seen from the creation of the world up to our own time" to be his most important discovery. Title page of Galileo's Starry Messenger. In 1613, in a long unpublished letter, Galileo began arguing that scripture and Copernicanism were compatible. Aristotelians tried to bring the power of the Church against Galileo, pointing to Bible passages that clearly described the Earth as unmoving. Galileo argued that while the reconciliation of scientific facts with the Bible was a matter for theologians, they should not interfere with scientists studying nature. In 1616 the Church ordered Galileo not to hold or defend Copernicanism. In 1624, Pope Urban VIII, a friend of Galileo, gave him permission to discuss the Copernican system in a book if he gave the Ptolemaic system equal time. The Dialogue Concerning the Two Chief World Systems was published in Florence in 1632, after some changes required by the Pope. This is usually considered Galileo's masterpiece. Despite his claims to the contrary, the Dialogue represents Galileo's strongest endorsement of the Copernican system over its Ptolemaic counterpart, giving devastating refutations of many central tenets of Aristotelian physics. The book still makes for fascinating reading today. There were complaints, and the Inquisition ordered Galileo to appear before it in Rome. He was forced, probably under threat of torture, to acknowledge that he had gone too far in his arguments for Copernicus, and to abjure the Copernican "heresy." His book was put on the Index of forbidden books, where it remained until 1835. In 1633, Galileo himself was sentenced to life in prison. The sentence was immediately commuted to permanent house arrest. He spent his remaining years in his villa in the hills above Florence, writing another masterpiece  not on cosmology but on physics and mechanics. Aristotelian cosmology envisioned spheres carrying the planets around the Earthsolid crystalline spheres, according to some, which provided the physical structure of the universe. Late in the 16th century, Tycho Brahe observed comets moving through the solar system. This fact shattered the crystalline spheres. Parallax: apparent change in the direction of a star caused by a change in the Earth's position. Tycho was still conservative, however. He was reluctant to set the Earth in motion. As an alternative to the Copernican universe with all planets circling the sun in the center, Tycho had his own system of the world. In it other planets circled the Sun while the Sun circled a stationary Earth at the center. 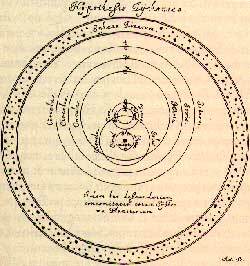 Right: The planetary model, conceived by Tycho around 1583, 40 years after Copernicus's book, was an unconvincing attempt to reintroduce geocentrism in the Copernican planetary system. From the standpoint of apparent planetary motions as seen from Earth, this system is observationally indistinguishable from the Copernican model, yet maintains the fixity of the Earth. The latter belief was held by Tycho to the end of his life. A main reason was that he had been unable to detect the annual parallax of the fixed stars predicted by the Copernican model, despite the unprecedented accuracy of the observations carried out with his giant instruments at Uraniborg. Tycho could measure parallax down to 2 minutes of arc (1/30 of a degree). The failure to see parallax for fixed stars implied that they would have to be located hundreds of times farther away than Saturn, the outermost planet known at the time. Image reproduced from Hevelius' Selenographia. Before Tycho died he established Johannes Kepler as imperial mathematician to Rudolph II, the Emperor of the Holy Roman Empire. 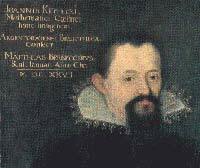 Tycho's data provided the basis for Kepler's work. Born into an undistinguished and poverty-stricken family, Kepler attended the University of T�bingen (now in Germany) on scholarship, studying mathematics and astronomy. He went on to the theological school, intending to become a Lutheran minister. Soon he was asked to leave and teach mathematics at a school in Graz (now in Austria). 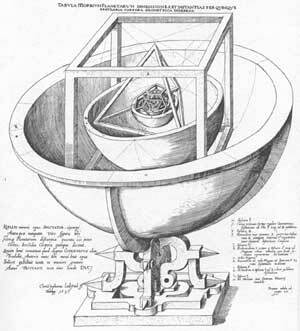 It was here that he imagined his quixotic world model based on Platonic solids. The theory was wrong, but it won Kepler renown. After Tycho Brahe moved from Denmark to Prague, Kepler visited him there. Kepler recognized the value of Tycho's voluminous observations, more accurate than any previous. He inherited both Tycho's data and the favor of the Emperor following Tycho's death in 1601. Studying the data, Kepler found what later became famous as his three laws, along with many other supposed regularities, some correct and others now forgotten. Kepler believed that God the Creator had created an orderly and harmonious world. 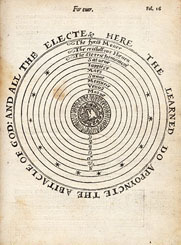 Kepler was committed to Copernicus's heliocentric system both for its technical advantages, which made it possible to dispense with some of the complications of Ptolemy's system, and on philosophical grounds, including a symbolic identification of the Sun with God at the center of all things. Kepler's colorful life was marred in the end by, among other things, his mother's trial for witchcraft, and a periodically nomadic and economically uncertain existence under the stress of wars and political upheavals. Right: Kepler's model of the universe with Saturn's sphere outermost, showing how the suppose distances were set by geometrical rules. Belief in uniform circular motion had been a fundamental aspect of Western astronomy for two millennia. This belief was broken early in the 17th century. Kepler, using Tycho's observational data, showed that the Earth and the other planets all travel around the Sun in elliptical orbits. This was the first of Kepler's three laws. It was published in 1609 in Kepler's book on his new astronomy, Astronomia nova. The laws Kepler found for the motions of the planets applied equally to the orbit of the Earth. He had abandoned the ancient distinction between the physics of our earthy sphere below the Moon and the celestial physics of a higher realm. Aristotelian physics no longer worked in the universe of Copernicus and Kepler. A new explanation of how the planets continued to retrace the same paths forever around the Sun remained a central problem of cosmology until Isaac Newton explained how objects move under gravity. He accomplished this by showing how motions in the heavens obey the same laws that determine the movement of bodies on Earth. This led the way to understanding what was increasingly seen as a mechanical universe.